Kékszakállú’s title card hits at just past 15 minutes in, effectively cordoning off a humid summer’s end prologue from the chillier movie that follows. The late-landing title is a 21st-century International Art Cinema hallmark (a trend that perhaps began with the 2002 duet of Blissfully Yours and Japón), as familiar as the abrupt movie-ending cut to an ambiguous black—a move which seems to have all but displaced the climactic freeze frame. Argentine filmmaker Gastón Solnicki, here and in several other aesthetic choices (locked down, wryly symmetrical compositions; the studiously elliptical deployment of narrative material; spare, precise sound design; jarring selections from a Bartok opera inserted at odd ends), evinces a clear awareness of, and allegiance to, the tactics that have launched films to Rotterdam, Locarno, and other similarly minded festivals. A cast of young women on the cusp of major change enmeshed in a haze of amorphous, free-floating sexuality also suggests that the shadow cast by the work of Lucrecia Martel may remain long in his home country. The name of the film comes from the Hungarian translation of “Bluebeard,” the possessive husband and wife-murderer of legend. A kékszakállú herceg vára, Béla Bartók’s one-act opera (his sole operatic work), inspired Solnicki’s narrative project, and the French fable has provided regular fodder for cinema over the years—Ernst Lubitsch’s 1938 farce Bluebeard’s 8th Wife and Catherine Breillat’s more erotically charged 2009 Bluebeard being two of the more notable examples. Curiosity about the forbidden lies at the center of the tale, in which a mysterious and ugly nobleman takes a local girl as his latest bride and offers her free rein in the form of the keys to his castle, provided she stay out of one room in particular. When the lord heads off on a trip, the girl’s inquisitiveness gets the better of her and she ventures into that chamber only to discover the corpses of her husband’s previous seven wives. Solnicki’s modern take on the material is free of any on-screen violence or obvious terror. Instead of one wife, he offers us seven women, all named in the credits, if not in the film. Most seem to be in their early twenties, though one is just on the cusp of her adolescence. The film begins in the heat of the summer, with the youngest girl and her twenty-something sister spending time at the pool, leisurely breakfasting, and, in the case of the older of the pair, occasionally taking up with hunky young men. Kékszakállú proceeds in an unhurried fashion, from one static shot to the next, with edits more often than not bringing about changes in time and space, rather than additional vantage points on events. Solnicki resists the urge to coalesce his vignettes into a more structured narrative experience for the entirety of the film’s brief running time, even as it adds more and more characters to the mix. So much is left unsaid in Kékszakállú that watching it almost reaches the level of gamesmanship, with Solnicki throwing ever more information at the audience and challenging us to make of it what we can. Following the aforementioned late title card, most of the film takes place in a grey, anonymous city. The older sister, now surrounded by a group of friends, is living on her own for the first time and struggling with this new reality, a fact revealed in one of a handful of conversations used to directly communicate contextual material of narrative import. None of the women we meet across the course of Kékszakállú ever truly metastasizes into a full character, except perhaps Laila (Laila Maltz), who takes a job in factory to escape living with her father (though he is also head of the same factory) and who is last seen in the film’s final shot onboard a ferry to Chuy, Uruguay, to handle an emergency while Bartok crescendos yet again on the soundtrack. (The emergency is never explained, though, given Catholic Argentina’s restrictive abortion laws and the general permissiveness around the practice in Uruguay, we might hazard a guess.) By the movie’s close, the season has shifted back to summer, and Solnicki’s collected narrative events suggest the film’s conceptual kinship to the French legend: though not in obvious trouble, the women here all seem to be held captive by their ages and stations, eking out small pleasures (such as a perfectly boiled octopus tentacle served at a low-fi dinner party in a barely furnished apartment), while generally wondering and waiting for what is to come next. Laila, the most seemingly distressed of the girls—she fights with her father, her friends, her sister—attempts a dramatic escape from Bluebeard’s castle, though in Kékszakállú what keeps her is her gender and her age, and her keep is a grim modernist slab tucked into the countryside. As a device, Solnicki’s regular insertions of the Bartok opera feel conceptually light but aesthetically heavy. They don’t so much help structure the film, or ground it in myth so much as intrude upon the progression of delicate compositions. Perhaps the impulse to introduce audio explosions into a contained visual framework was conceived as a way to inject some of the unruly emotion of his previous feature, the chaotic personal documentary Papirosen, into a more abstracted space, but the film could likely function as adaptation just as easily without them, so generally successful is Solnicki at carving his “story beats” down into pinpoint precise gestures and movements highly suggestive of the legend’s central ideas. 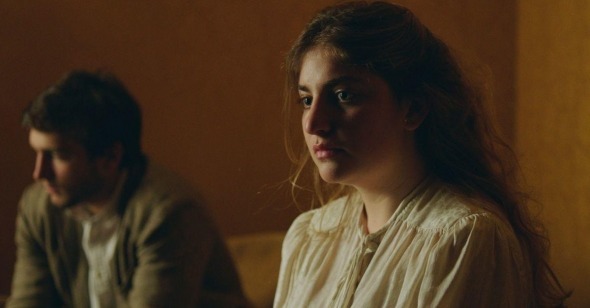 What Solnicki’s ended up with in Kékszakállú may not be as excitingly rough and tumble as its 2016 New York Film Festival sidebar-mates Mimosas or The Ornithologist, or perhaps even as affecting and effective as his own Papirosen. Yet there’s something to be said for a narrative work that bucks a common tendency to introduce many strands at a narrative outset and slowly wind them together, choosing instead to remain willfully obscure, resistant. Solnicki and his actresses likely know their characters and stories inside and out, but Kékszakállú ends up a richer portrait for only offering us shards and glimpses of these seven lives.